Advent has always been one of my favorite seasons of the year. It is a time to slow down and to ponder the things of Christ. It is a time to intentionally dwell on what it means that Christ came to a waiting world, and to be faithful as we await His return. The season is filled with the sights and smells of Christmas: trees, lights, carols, and bells. But it is also filled with invitations to slow down and rest, and to reflect on Jesus and all that He brought with him in His birth: hope, peace, joy, love, and light. But if I am honest, I have struggled to feel much peace and hope or see much light this Advent. Because this world can feel lonely. It can be dark and it can rub raw, broken on every edge. The news and the stories say it loudly; though we celebrate Christ’s birth we are still waiting for shalom, still submerged in sorrow and sin. Where is the light? Where is the peace? Where is the hope? 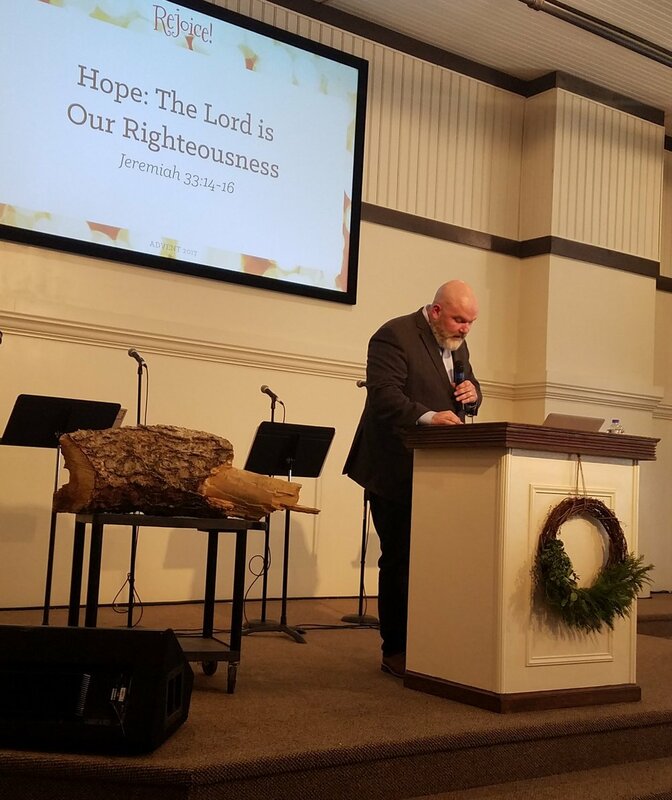 "The news and the stories say it loudly; though we celebrate Christ’s birth, we are still waiting for shalom, still submerged in sorrow and sin. " Every morning I pass by two little potted plants my daughters and I planted at the beginning of Advent. We dug a hole in the soil, planted a seed, and sprinkled it with water. Every morning the girls come running to watch for the green sprouts to grow. They water the soil, and they eagerly wait. Two weeks later, there is this tiny green shoot coming out of the dirt. It’s small, tender, and vulnerable. And it is green, and it is full of life. "Though sometimes the world still feels like this giant dead stump, there is hope." A shoot from a stump. Life growing from what was dead, hope from what was hopeless. Though sometimes the world still feels like this giant dead stump, there is hope. Because the tiny, tender shoot that Isaiah promised emerged from a tiny little town called Bethlehem. Jesus. Emmanuel, God with us. God with us, because God came to us. And isn’t that what Advent means- “coming”? This dark, lonely, broken world- Jesus came into it. God Himself abandoned the comfort of heaven to come into the dark and hopeless stump of our sin, so that we could be reconciled to Him. He came so that we could be at peace, so that we could have a steadfast hope, whether we feel it or not. I know that it's true. I can read it in the pages of Scripture, the birth of Jesus. I can sing all of the Christmas carols and believe every word. But for some reason, this year, I just haven't felt the peace as near as I have before. "A shoot from a stump. Life growing from what was dead, hope from what was hopeless." But maybe, like Pastor Russ declared this past Sunday, maybe the peace of Christ is less about our feelings, and all about our line of sight. If my girls had not been hunched over the tiny plants watchfully waiting to see them grow, we may have missed the tiny green shoot. We may have gotten distracted by other things and forgotten to look for the life. Their eager anticipation to see the plants grow kept them looking, watching, and waiting. And I can feel the Lord lifting my eyes and convicting me of why hope and peace have felt so elusive this season; I haven't been looking. The Israelites had been promised a King, but they weren't looking in Bethlehem, and they certainly weren't looking in a dirty stable. They were seeking their Messiah, all waiting for a Savior. And He came. But so many missed it, because they weren't looking in the right place. They were looking for the shiny, the beautiful, the powerful. And the Lord whispers to me that maybe I have been looking there too. Maybe I have been waiting for the big, sparkly, glittery miracle. Maybe I've been believing that my hope can't be real until all the darkness disappears and all that is left is light. "While darkness hides behind every door, hurt in every house, and sin in every story, Advent dares us to believe that there is a light that breaks through." The light shines IN the darkness, not despite it. The darkness gives a backdrop for the light to break through. And it will break through. Only in the deepest darkness is the light most pure. 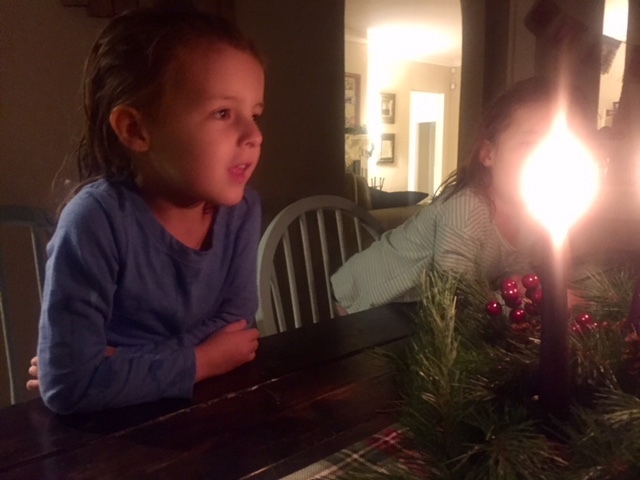 No matter how dark your situation, dare to look for the light this Advent. Dare to seek out peace. Look for the tiny shoots of green growing up in what seems stump-like and hopeless. Watch for it to slowly unfurl. I'm having to preach this truth to myself; keep looking for the Light. Like me, have you felt hopeless, peaceless, joyless this Advent? The good news is He is there, tiny and tender, breaking in and overcoming. Look for Him in the dark, in the sadness, in the ache. Look for Him in the longing and the loneliness. Don’t stop looking for Him in the places you’d least expect Him to be, because He came to us in the tiniest town, in the dirtiest stable, and in the lowliest manger. "Don’t stop looking for Him in the places you’d least expect Him to be, because He came to us in the tiniest town, in the dirtiest stable, and in the lowliest manger." If you haven’t yet, listen to last Sunday’s sermon and consider what things might be hindering your view of Him who is our Peace. Carve out moments of silence and solitude in the busyness of this season. Jesus came small and quiet, and He continues speaking in the “still, small voice”. Don’t let the noise drown out His voice. Consider keeping a journal of all that you are thankful for, big and small. When we are looking for the gifts, we find that there are far more evidences of light than we see when we aren’t looking or keeping track. Go on a “light chase” with kids, or without. Chase down the best view of a sunrise or a sunset, or go searching for the brightest Christmas lights in town. Pray for ways to be the light to someone else this season. There are people everywhere hurting and aching to know hope. Don't be afraid to step into their darkness, like Christ has stepped into yours, and shine the light of Christ that is in you. As we celebrate the coming of Christ this Advent, and as we watchfully await His return, I pray we keep looking for the light in the here and now. Let us be people that dare to believe Him when he says, "The light shines in the darkness and the darkness has not overcome it."